What is our purpose as your freight forwarder? Ultimately, our purpose is to provide a bridge between seller and buyer. How do I know an equipment seller is legitimate? How can I be sure the machine I am buying actually exists? How can I be sure the machine I am buying is in good condition? How can I protect myself against being ripped-off by the seller, once I send payment? What is it going to cost me to import the equipment I am buying? How do I get a budgetary estimate for the logistics of this project? Is it possible to move something this big from its current location? Contact a Freightplus heavy freight specialist for answers to any of these questions. What is involved when shipping heavy equipment from one country to another? It usually requires a full range of services including: pre-purchase inspection, payment facilitation, configuring large equipment for transportation, arranging and tracking inland transportation, cleaning or fumigating to satisfy the destination country’s biosecurity requirements, preparation of shipping and export documents, interface with border warehousing or yard storage, booking cargo space, negotiating freight charges, freight consolidation, cargo insurance, cargo surveys, loading and securing cargo on board and tracking the vessel’s progress en route to destination. At destination, there’s the payment of port service charges, unloading of cargo, preparation and lodgment of import customs clearance documents, coordination of customs and/or biosecurity inspections, addressing compliance matters, identifying and coordinating the appropriate road transport vehicles for the load, lifting of heavy equipment onto road transport and coordinating and tracking road transport to final destination. To comply with export documentation and shipping requirements, many exporters utilize a freight forwarder to act as their shipping agent. The forwarder advises and assists clients on how to move goods most efficiently from one destination to another. A forwarder’s extensive knowledge of documentation requirements, regulations, transportation costs and banking practices can ease the exporting process for many companies. A good freight forwarding service can save you untold time and potential headaches while providing reliable transportation of your cargo at competitive rates. So what does that actually mean in terms of what Freightplus does? As a freight forwarder, we act as an intermediary between a shipper and various cargo transportation services such as shipping, air freight, trucking, and moving goods by rail. We utilize established relationships with ocean carriers, ship owners, air freighter operators and trucking companies. Because we manage the shipping of heavy cargo for many exporters and importers, we enjoy economies of scale and preferential rates with those shipping lines who specialize in shipping heavy equipment. The combined cargo volumes of our entire customer base enable us to negotiate the best possible price to move heavy machinery and industrial cargoes. 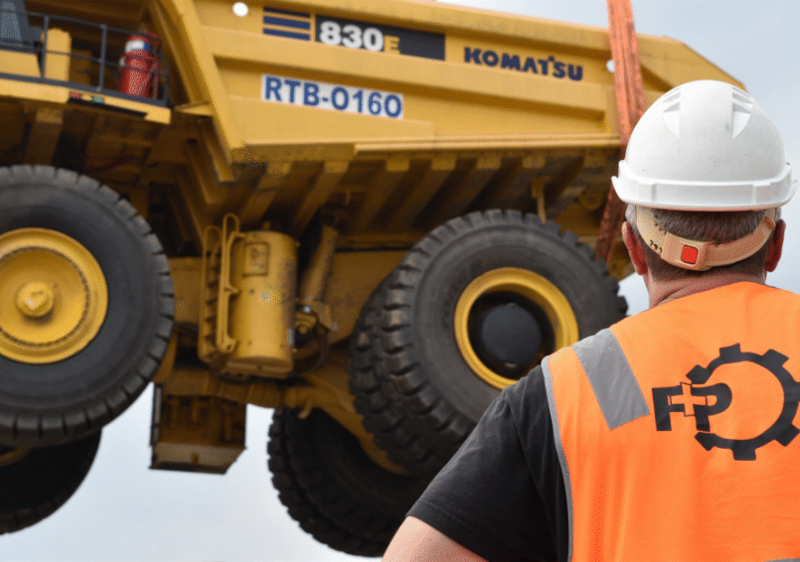 With our knowledge and experience shipping mining equipment and construction machinery and managing challenging project logistics, the Freightplus crew is able to ship heavy equipment by the most economical route by utilizing a combination of services that best balances speed, cost, and reliability to suit your specific needs. Freightplus is one of only a few freight forwarders specializing in the shipment of heavy equipment and machinery. Being specialists in shipping machinery, the economies of scale we enjoy with international shipping, also apply to support services for shipping heavy machinery. In order to provide a comprehensive shipping service for heavy equipment, Freightplus has established an extensive range of door to door solutions for transporting mining equipment, construction machinery, marine and industrial cargoes. For the last 18 years, we have focused exclusively on shipping over-dimensional freight. Our vision is to be the world’s best and most sought-after movers of heavy machinery.